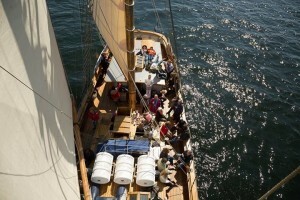 Share the post "This moment… June 13, 2014, on board Hoppet, Gulf of Finland"
So we sailed away from St Petersburg, we arrived in Hanko to the sound of trumpets and horns and 100 people greeting us at the shore. We enjoyed Hanko during some days of sun and good wind, and we finally left Hanko to cross the Gulf of Finland to Estonian shores. We sailed into the fog and the bigger waves. There was a touch of nothingness, of eternity with the invisible horizon and the silence on board. We were all out on deck, because down in the cabins you would get seasick directly. The sea was really just stubborn, sending us long irregular waves but almost no wind. I loved the feeling of a bigger, outer sea. Finally. We talked, we took care of each other, we didn’t eat so much. Mostly staring out at sea. Luckily enough we had some good rum at the beginning of the trip, and according to the crew this good quality rum saved us from any accidents or damage. Apparently they had tried some cheaper stuff at the first sailing trip from Tallinn to St Petersburg, which ended in really bad weather keeping them from reaching Russia for one whole day. So after this experience their conviction is even stronger: the captain and the crew (and sometimes me) will have a good and expensive sip of rum at the beginning of every sailing leg. These hours on board are somehow magic. First they felt unreal, totally out of the normal context, giving us time to just do nothing for several days. I had some problems in accepting this. Then we got used to this little bubble on board, and after landing in Hanko we actually felt unable to leave the ship. The safe area. After the Hanko Festival most of us went home to Helsinki for some days, but even those days felt uncomfortable. Somehow our everyday life in Helsinki became unreal. We waited to get back to the ship, and felt unable to enjoy the “time off”. And here we are, between the Isola Femina, Naissaar, and Tallinn, with the sails set in a bit of wind, not wanting to reach our destination too fast. Yesterday at the island we had a sauna experience impossible to describe. I will not even try, but it included a train and a television and a couple of goats. We got back to Hoppet, we had pasta leftovers and put on some music. There was a moment when nobody said anything, we just eat and looked at each other. And I saw, from the faces this unmistakable feeling of happiness. And I loved that moment. Share the post "This moment…"